Varina High School is home to all types of entrepreneurs. 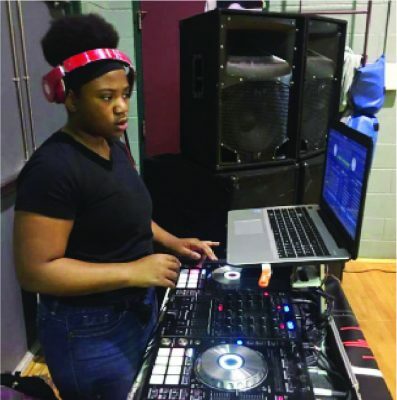 One that has recently graced the Varina scene a DJ is Junior TeihYanna Thomas. TeihYanna has been DJing for almost a year now. She said that she would describe her DJing style as random and because you never know what she’s going to play, whether it’s Hip Hop, R&B, or even country. TeihYanna said she felt both excited and nervous about playing at homecoming. “I’ve DJed a lot of parties and events, but this is my actual school, I’m going to be among all my peers so it’s going to be a little different and the pressure is really on,” TeihYanna said. TeihYanna’s girlfriend, Diamond Lockette, said that she is proud of TeihYanna and she can’t wait to see what the future brings. TeihYanna has worked a number of Varina events such as the 2017 prom, academic and fall sports pep rallies, and the 2017 homecoming. “I just hope for my DJ business to flourish and I think that it is really cool that Varina High School continues to support me and my business,” TeihYanna said. For more information, you can contact TeihYanna at (804) 646-4768.